The Eastern Wyoming Arts Council presents Cascada de Flores. This performance will take place on February 10, 2012 at 7:00 p.m. in the EWC Fine Arts Auditorium in Torrington, Wyoming. Cascada de Flores delights in creative collaborations, recording projects, community outreach activities and in-school programs and workshops. Cascada de Flores’ eleven years of existence have seen triumphant performances in venues such as the Zócalo of Mexico City, La Tasca of Xalapa, Veracruz, the International Festival of Trova “Pepe Sanchez” in Santiago de Cuba and Albuquerque’s National Hispanic Center. The trio has toured the performing arts venues of the western and central United States receiving multiple standing ovations and excitement from all ages and cultures. The ensemble has thrived from collaborations with other artists and local organizations such as Larry Reed’s Shadowlight Theater, Roberto Borrell’s Orquesta La Moderna Tradición, Ensambles Ballet Folklórico de San Francisco and the San Francisco Silent Film Festival (for which Cascada arranged the score and accompanied live the 1917 Mexican silent film “Tepeyac”). Tickets are $15 and may be purchased at the EWC Community Education office, or by calling 307.532.8213 or 307.532.8323. 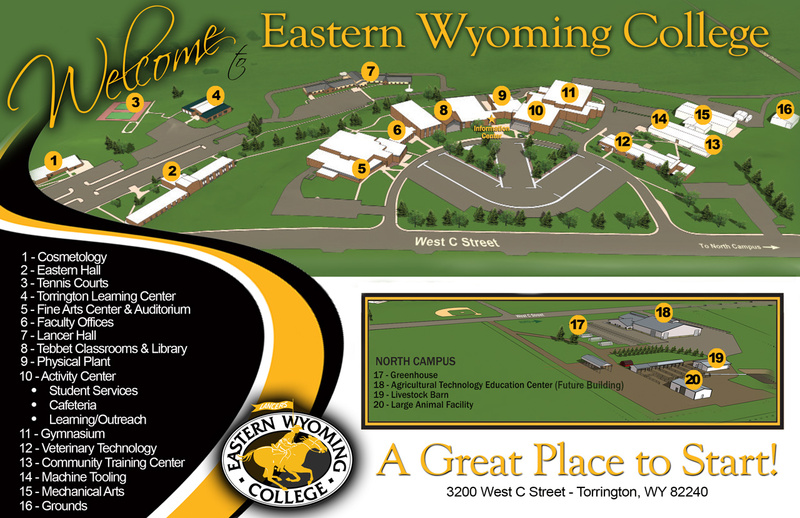 Eastern Wyoming College will be offering a Heavy Equipment Operator course. This course will be a five week (200 hour) course using the National Center for Construction Education and Research (NCCER) curriculum and use Prov national assessments for students. Successful students will receive a level one certification. The NCCER level one certification is a nationally recognized certification by the heavy equipment industry. Students will learn about and operate different pieces of heavy equipment. The course will cover core requirements, preventative maintenance, and safe operations of the equipment. Equipment used for this course include: scraper, dozer, backhoe/trackhoe, loader and excavator. This course will be held February 13 through March 16, Monday – Friday from 7 am to 5 pm. Workforce training grants are available to students and employers. For more information or to register please contact Jo Ellen Keigley, EWC Workforce Development office at 307.532.8366 or email at workforce@ewc.wy.edu. Critically acclaimed author and field staff writer for National Geographic Mark Jenkins will present The Healing Fields on Thursday March 8th in the EWC Fine Arts Auditorium at 7 p.m. Mr. Jenkins spent a month in Cambodia – crossing minefields, interviewing victims, and searching for Miss Landmine Cambodia – to create this Photo-Illustrated presentation The Healing Fields: The Legacy of War and the Search for Miss Landmine Cambodia. Worldwide, there are tens of millions of landmines buried in over 80 countries. Unlike bullets, after a war ends, landmines are still alive, waiting to blow the legs of innocent farmers and shepherds. After 30 years of war, Cambodia is one of the most heavily mined countries on earth, but through progressive government programs and substantial foreign aid, it has become the world’s leader in demining and victim rehabilitation. This presentation will be given in six forums around Wyoming. The forums are free and open to the public. This presentation expands on Jenkins article, “The Healing Fields,” which appears in the January 2012 issue of National Geographic. Mark Jenkins is a critically acclaimed author, a field staff writer for National Geographic and the writer-in-residence at the University of Wyoming. Jenkins has published in over 50 national and international magazines and newspapers. He is the author of four books including A Man’s Life (Modern Times, 2007), The Hard Way (Simon and Schuster, 2002), To Timbuktu (Morrow, 1997), and Off The Map (Morrow, 1992). This presentation is free and open to the public. This lecture is sponsored by the UW International Studies Program, the UW Outreach School, and the UW Office of Academic Affairs as well as each partnering community college. For more information or questions, please contact Court Merrigan Learning Skills Lab Coordinator, at 307.532.8378 or e-mail at court.merrigan@ewc.wy.edu. Are you interested in continuing your education? Here is a chance to take some college credit classes here in Guernsey! The following credit classes will be offered this semester through the EWC Outreach Center of Guernsey. These classes are open to anyone in the community. High school students wishing to take these classes for college credit should see Mrs. Heimbuck, EWC Outreach Coordinator for more information. Registration for these classes begins now by calling 307.836.2736 or in person at the EWC Outreach office at Guernsey-Sunrise High School, Room 10. This class will cover instruction, reading, and writing practice in the fundamentals of composition, including essay assignments such as expository, argumentative, persuasive, comparison and contrast, analysis, and research papers. Prerequisite: ENGL 0640 with a grade of “C” or better or appropriate score on placement exam. Tuition and fees: $261 plus books. This is a fundamental introductory course which meets the requirements of the Wyoming statutes providing instruction in the provisions and principles of the constitutions of the United States and Wyoming. Students cannot earn credit for both Political Science 1000 and Political Science 1050. Prerequisites: Placement score of ENGL 0640 or better and no reading improvement required, or appropriate ACT score. Ballroom, Country and Swing Dance class will start Sat., Jan. 21 and end Feb. 11. Class will be held from 2-3:30 in the Multi-Purpose room. This class is open for dancers of all ages and ability, both single and couples. Cost is $40 per student. Fundamentals of Food Safety will be held Jan. 23 and 25 from 6-8:00 pm. Cost is $15. This class is for anyone in the community serving food to the public. Groups using the kitchens in our school are asked to have a representative receive this certification to serve fundraising meals. Cent$ible Nutritionwill be offered on Tuesdays, beginning Jan. 24 through March 13 from 10-11 am. Class will be held at the United Presbyterian Church. This class is free for those who are income eligible. Sign Language for Kids(Kindergarten thru 2nd grade) will start Tuesday, Jan. 10 and end on Thursday, Jan. 26. Tabitha Anderson will be teaching simple signs, the manual alphabet, colors, and counting. Class will be held on Tuesdays and Thursdays until Jan. 26 and the cost is $5. Registration forms are available from the EWC Outreach/Comm. Ed. Office or from Mrs. Martin in the school office. Preschool Story Time(3-5 years olds) This offering will begin on Monday, Jan. 9 in the G-S Elementary Library at 10:30 am. Cost is $10 for the 10 week session, which will end on March 19, 2012. Join us for a fun time of stories, crafts and snack. EWC Outreach office is excited to bring these classes to you as well as credit classes. Please see the Spring 2012 brochure in your mailboxes soon for a full listing of offerings from Tri-City Parks and Recreation and the EWC Outreach and Community Ed. Programs or call the office at 307.836.2736 for more information. Eastern Wyoming College invites the community to attend a community appreciation night at the Lancer basketball games on Friday, January 13th. There will be free admission and popcorn to all who attend. The women’s game begins at 5:30 and the men’s game is at 7:30. The Lancers will be playing Trinidad State Junior College. For more information, please contact the College at 307.532.8200.